I did a fun little project that most of you have probably tried. I used a bit of epsom salt to mimic snow and ice! 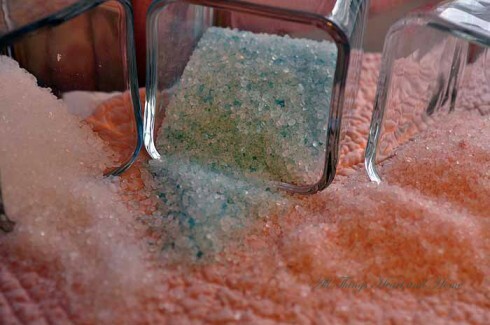 To make the pastel blue add 1 drop of food coloring to 1 cup of Epsom Salt. To make the pastel pink (hey, Valentine’s Day is coming!) I used a smidgen of craft paint mixed with 1 cup of Epsom Salt. So sparkly and pretty! Nice job! I spent my weekend taking down Christmas stuff and cleaning – maybe next weekend there will be time for a craft project or two. What a great project on the glass votives, Robin! I used some Epsom Salts on a tray with candles this year as “snow”, but I really like this icy look. So pretty! Thanks for the inspiration. When I get Christmas down and put away I’m going to try a little winter sparkle! 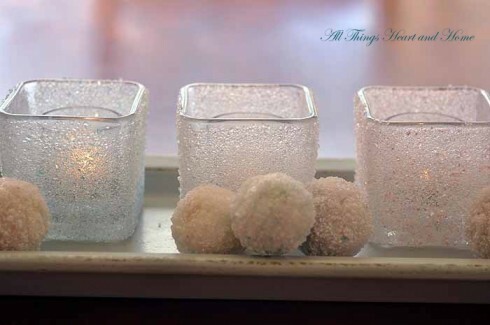 These are really beautiful and how lovely to add snowflakes around the house. Love it all! All that white makes everything look so fresh and clean! Just what we need after all the holiday decorations have been stowed away! What a beautiful way to glitter up ordinary items. Love it! I really like the candles; they’re so gorgeous! Neat ideas! Isn’t mod podge great? And Epsom salt does come in handy as cheap, instant snow. Thanks for sharing. My mantel is looking very bare since Christmas. I need to use some of your ideas to spruce it up. This is just what I needed to inspire my winter decorating! Working on my winter mantel this week! It looks beautiful. Thanks for the inspiration. I keep telling myself I am going to try this and you have convinced me. It is on my list for this week. What a great idea!! I’m totally in love with this! Thank you so much for sharing! I love this winter decorating idea, and I guess I don’t get out much because this is the first I’ve seen it. I’m going to give this a try! Lovely! I did this for a centerpiece in December. I coated red & white candles in Mod Podge & did just like you. They were beautiful lit up all together in the middle of the table for our event. I also took small terra cotta pots & painted them red, painted the rim white – Mod Podged it & coated in ES. They were the favors for each person at the table, of course filled w/ goodies. It’s funny b/c most people don’t think to craft w/ Epsom Salt. Everyone was very surprised. I think it’s great =) And I too decorate for winter!! SO pretty! I have half a bag of epsom salt left. I used some for Christmas in my candle holders. Actually, I will have a whole bag if I dump it all back in. 🙂 I love the sparkle it adds, I never would have thought to do any of these ideas. Love these Winter Creations and a great way to transition from Christmas!! I love this idea! My mantle looks so bare now that all the Christmas decor is put away. I love leaving a bit of winter out, so off to buy some modgepodge. BTW…do you have a source for those cute square candle holders? I also love that snowflake garland. I looked for one this year to no avail. Oh, wow. There’s a whole Espom wintry world I didn’t know about! You know that I am loving this since I leave up 5 of my trees and convert them to Valentine’s Day trees. 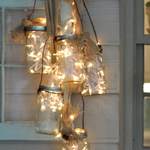 And I change the outside of the house over to Winter decorations so I will definitely be using this idea. Love the thought about pink paint to create a pink paste!! What a great idea! Yes, feeling the post holiday blahs here. But hopefully not for long. love this craft! Do they shed much? I’ve been looking for items to fill my apothocary jars. This will be great for winter! How pretty! This Dec is the first time i saw epsom salt decorated goodies, i can’t wait to try it out some time! What a cleaver idea to wash away those post holiday blues. I especially like the candles and candle holders. So pretty. Is the result very delicate or could these be saved for the next year too? Do you think you’ll have to re-salt? Kat…I’m hoping to save them! They did shed a bit at first, not as bad now. I read you could spray a gloss finish over them…maybe I’ll try that! This whole setup is completely gorgeous! I love it. I have been checking out your blog for a couple of weeks. Just wanted to tell you that …I like. The crafty project sounds fun and easy. Perhaps , I wo=ill try it. When I suggested this to my daughter last week she thought I was nuts! She wanted something wintery for her dorm. So I am sending her the link and she can make them…with flameless candles of course. I also sent you an email today….when you have time. Ha! Oh, this is how out of touch I am, I had no idea you could make such cute things with Epsom salts! 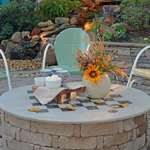 Love seeing all of your projects- just breathtaking! 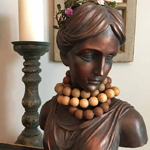 Love the stunning mantel…wish it were mine! I just spray painted my brass screen black as it was ugly, but would love ideas on how to lighten it up. I have a blustone fireplace and it is very nice and quite pretty, but would love to make it lighter without paint. Any ideas anyone? Would love the feedback! Thanks for this great blog. 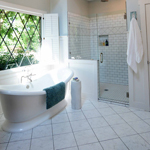 The epsom salt ideas are very cool – may have some left over from the birth of my 2nd child after those sitz baths – hahaha!! Great idea! They are so nice and very wintery…might have to give that a try myself. Thank you for sharing! 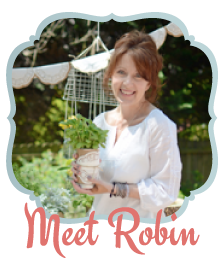 I love these, Robin!!! I also have seen them on other sites, but yours are so beautiful! I want to give them a try. They look like they would be fun and so easy!!! Thanks for your sweet email. Have a wonderful week. Love & blessings from NC! Wow, I love your winter sparkle! And what a great idea, because I always feel kinda bummed out when I have to put away Christmas and my house is back to the same-ol-same-ol. Do you have to worry about the salt damaging the furniture finish or anything? I was actually sent to your site to read a (really old) post about feeding stray cats, as I’d just posted about the same thing. I’m really glad I came by! I was so excited when I saw this post! Using epsom salts seemed to be a more natural way of crafting too, as opposed to store bought glitter. My daughter and I decorated some pine cones, a candle holder and a foam ball yesterday after I saw your post. The pine cones came out so nicely. 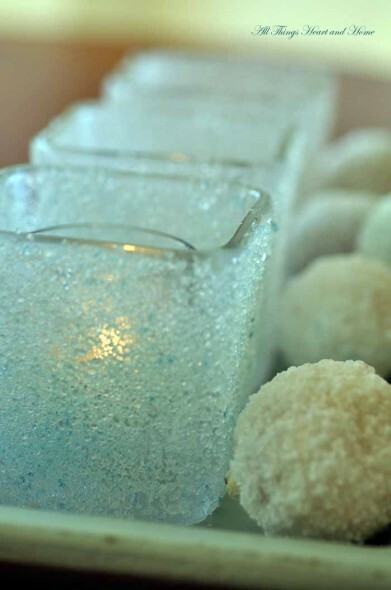 We achieved a bluish tint for the foam ball and candle holder by adding some craft paint. I plan to post about it on my blog soon, to spread the word about this neat idea! 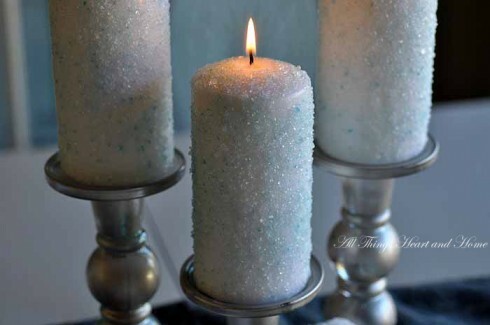 One word of caution – when you burn the Epsom pillar candles, watch them carefully! I almost burned the house down in 2009 when I did this project. Something happens when the flame burns the Epsom salt. Carmie…I have been concerned about this! I think I’ll investigate further…thank you BUNCHES for the heads-up! Your decorating is SO pretty! The salts are a great idea! LOL, yesterday I was at the store and a guy spent 20 minutes looking for epsom salt in the spice aisle! You “AMAZE ME”! Thank you for linking up to the “Amaze Me Monday” blog party!! This is sooo pretty! I put out all my snowman things after I take down the Santas…keep up the greenery and berries to go with them. In my snow village this year, I put ES in champagne flutes and put a white tea light in each one, then lit them on New Year’s Eve to light up the village, along with votives. I have placed votives in the ES in other containers, but had not heard about it being flammable! Careful! 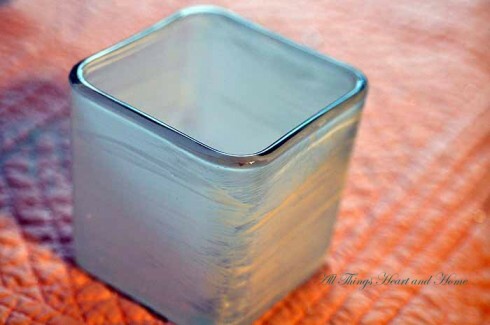 Love the icy look they give when glued onto the glass! the possibilities are endless! According to this, Epsom Salt isn’t flammable. I would really like to know if anyone has found anything else out about this being a ‘flammable’ project. This is the only site I have come across that I’ve seen that mentioned. I plan on doing this project with my daughter’s class the end of this week. I wonder if the person that had the experience with the fire used something other than mod podge? Would love to hear if anyone has found out this would not be a good craft to do with kids. Thanks. My mom put Epsom salt in a class vase with cranberries on top and a candle this year, and a couple days ago we walked into the kitchen to find flames shooting out the top the vase. Epsom salt has magnesium in it which is a highly flammable element. It can burn in oxygen, nitrogen, and carbon dioxide environments. It can also burn under water. It is really hard to ignite Epsom salt though, it has to get really really hot, and the conditions have to be just right. We were lucky cuz the flames were contained in the glass vase. I wouldn’t like to think what would have happened if it had just been an open candle…. So once again, its really rare that it happens, but it is possible!! 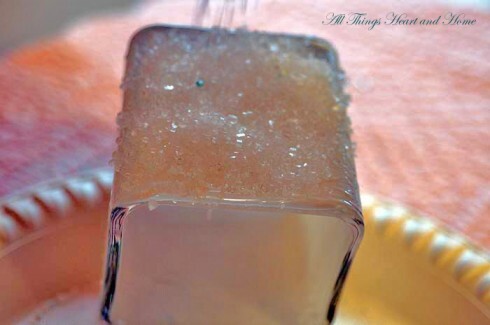 Never would have thought of Epson Salts for a snowy or icy look. Might have to try that one. Such a great idea to decorate various things. I tried it & like it too much. I would like to share more ideas for craft projects. 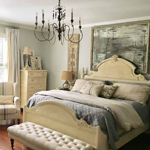 Beautiful pictures and great ideas! Just FYI: Epsom salts are not flammable, but many things that are used to adhere or seal epsom salts are flammable. Believe it or not, there is an Epsom Salt Council (who knew?) with crafts and information. Can’t wait to see!! Love you. Lovely! Thanks for the inspiration and tips. I took down Christmas today – it’s been up since before Thanksgiving and the house needed a thorough cleaning sans decorations! At first it felt clean and fresh, but now it seems a tad empty. I may try some of your ideas. It’s the only “snow” we’ll see where I am in Texas.